Hewitt Homeschooling was first introduced to me for one of my older boys in high school. It was one of the programs that consistently helped him in his composition skills. 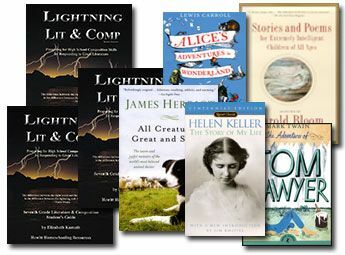 I was excited to try Gr 7 Lightning Lit Set for my daughter who enjoys reading, and thought it would help to hone in her skills earlier than the high school level. Lightning Lit & Comp comes with the Student Guide, Workbook and Teacher Book. You can purchase each one separately. For the year your student will read two novels, two non-fiction books, two short stores and several poems. I love the variation in reading, giving the student a taste of each one. The first story you start with is Rikki-Tikki-Tavi by Rudyard Kipling. The Student Guide gives the student an introduction to the story/book. It then has a section on While You Read giving the student things to be watching for and to consider while they are reading. There is also a vocabulary list included for the harder to understand words. The reading level of these books were a bit above what my 7th grader is reading, and it was helpful to have a few of the words defined for her in the beginning. I did have to help with some of the reading and understanding of the texts. This is not just a literature study however. They aren't reading the story and answering comprehension questions alone. There is more indepth information taught on the English level with each chapter. From Chapter 1 she learned about the plot line of the story going through and listing each phase of the plot. Then in the Workbook she would actually fill out those different points of the plot, reinforcing what she just read. Several of the workbook pages are simply related to English skills, and not to the reading material. At the end of the workbook exercises, the Student Guide has you do an additional writing exercise. This is a comprehensive English class for 7th grade. I was very impressed with the depth of it, even though some was above where my daughter is at. Just like the High School program, this one challenge and taught. Once we got to Tom Sawyer, the teacher was excited! My daughter was a bit intimidated with the length of the novel, this really being her first 'big' novel to read. She loves to read, but usually books she can finish right away. We would take turns reading, just to help her feel that she was understanding it, and we were working together. For me, this wasn't a program I could just let her go alone at, thought some more mature readers may be able to handle much of it on their own. I find that junior high age still needs that direction and help to learn to be self sufficient and once they are in high school they are a bit more self motivated learners. I was excited to see that they also have elementary programs as well. I am interested in checking this out for my younger son. I feel if I can get my daughter moving along with Hewitt Homeschooling Resources, she will be very well prepared for college literature and English classes. Just in having my older son work through one of the High School levels, showed me the caliber of the programs. One of the finest resources I have found on helping kids prepare for high school composition skills and beyond to college. See what my crew mates thought of this program by clicking on the link below.